Chase Elliott has a sprained ankle, but he has been cleared by doctors to pull a double-duty weekend at Daytona (Fla.) International Speedway as fill-in driver for the still-suspended Spencer Gallagher in the No. 23 GMS Racing Chevrolet in Friday night’s Coca-Cola Firecracker 250 NASCAR Xfinity Series race and fulfill his normal obligations as driver of the No. 9 Hendrick Motorsports Chevrolet in the Monster Energy NASCAR Cup Series in Saturday night’s Coke Zero Sugar 400. Elliott tweeted Thursday that he sprained his ankle in a swimming pool on July 4. “Horsing around at the pool yesterday and sprained my ankle, but I’m good to go @DISupdates. Xrays clean,” Elliott (@ChaseElliott) tweeted. Elliott had a notable limp upon his arrival at Daytona on Thursday. Elliott is 13th in the Cup Series points standings through the first 17 races of the 2018 season with four top-fives and eight top-10 finishes. 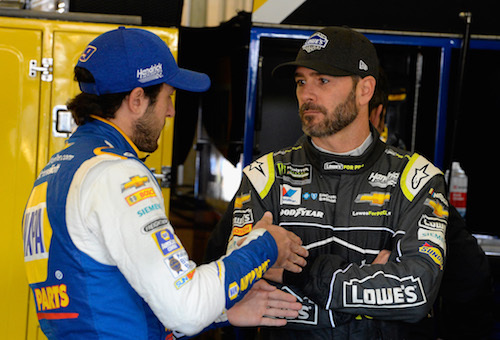 He trails teammate and seven-time champion Jimmie Johnson by seven points. Elliott was an early retiree the last time the Cup Series was at Daytona for the season-opening Daytona 500, as he was involved in a crash. He finished 22nd in last year’s July race there. The Xfinity Series race on Friday night will be Elliott’s fourth in the No. 23. He posted a best finish of second in the car last month at Pocono Raceway in Long Pond, Pa. The No. 23 won the most recent restrictor-plate race at Talladega (Ala.) Superspeedway in late April, Gallagher’s last race in the car.